Sorry, folks–As some of you noticed this went out with the text missing! Shows you how I screw up now and then. Hope this time you won’t be disappointed. So…. What a surprise! I have come across a terrific expose of what a huge scamming industry is lurking out there and is eager to pounce. Yes, it is alarming. Scary. The big scams are all explained in this November cover story. article in Consumer Reports’ November, 2015 issue. $3 Billion a year!!! And when you see the pain and the anxiety and the tragedy inflicted, it certainly is a crying, screaming, horrible shame. The magazine does a brilliant, detailed, comprehensive job. It tells of the scheming and conning going on every day by clever and relentless crooks. Smooth and sophisticated villains who are really professionals. Hard to believe. It gives fact-rich descriptions of eight popular scams. I was struck by the variety and the ingenuity. Mine is at the top. Explains each scam, illustrates each with the sad story of a victim, how they got hooked, how much they lost, in some cases how they were talked into wiring a number of payments! Photos of victims, their names, locations, backgrounds, it’s all there. Oh, if only I had read this before that phony lawyer Mr. Miller tried to con me out of those thousands of dollars—and nearly succeeded. All based on the phony story that my grandson Ryan was locked up in jail in Mexico City on two charges and needed bail. I would have slammed down the phone! Seniors like me are the prime target, but for sure many younger people are vulnerable to some of the schemes and could be attacked. The first of the eight case studies is about Beth Baker, 87, of National City, Calif. Her story parallels my story. She got a call from a smooth-talker telling her that Will, 24, the eldest of her five grandchildren, was in jail in Peru. Will was a guest at a wedding there. He was driving and hit a kid. His “lawyer” needed $5,000 right away. She sent it. He called back announcing a bad turn of events and wheedled her out of another cash transfer. Called again, sucked up more money, called again, won more. Beth sent him $65,000 over five days! The poor lady! That was the nearly the same scenario pulled on me. The big difference in my case is that the initial call came not from the lawyer, but from my grandson Ryan in Mexico City. I was convinced it was he–totally convinced. Then con man “Attorney”Miller exploited this. I was spared–saved– only through the determined efforts of Stephen Rednak, manager of the Liberty Bank branch here. The article is valuable in several ways—telling you what to be vigilant against, how to protect yourself, how to check out these stories, and what to do afterward, which besides reporting the scam doesn’t seem to be much. These scams are so clever and so smoothly played out on victims that you may face one someday and fall for it–become another sucker. This is my alert to you. You can read the article on your browser. 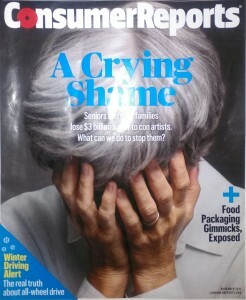 Just look up: Article “Crying Shame.” I tested it. It comes up. It’s a fascinating read. A true public service. The older I get, the more I believe it’s a jungle out there. And what is freakish is how I came upon the magazine, published last November, as I said. Would you believe, I found it in the “Take One, Leave One” basket of past-issue magazines at the Acton Public Library in next-door Old Saybrook here! Now the old question comes up: Was that find accidental? Or providential? We’ll leave that for another day.